If she farts you're both dead. Fake! The sparks should go the other way. So pathetically fake, but still funny I guess. pretty sure this is photoshopped..
HAHA it's funny cuz she's fat! Now that's what I call preload! Thats a huge b itch !! It redifines the term "low rider". Honey. we need to pass this truck, switch to afterburner! 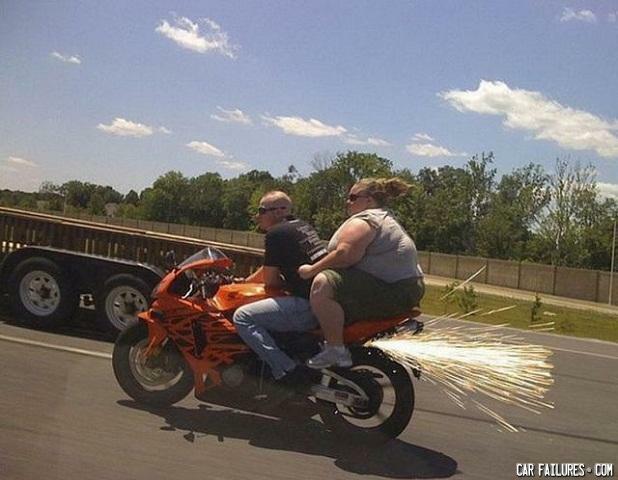 Pretty sure it's over the weight the bike can hold! It's just a photoshop of another picture on here! Wonder what makes the sparks. If it was the wheel, they would go down in front of the wheel, unless he's reversing at incredible speed...? But yes, she's a bit over "ideal BMI". What did the boy eat for breakfast?